Printmaking is a fascinating and engaging activity, rich with possibilities for making images and processes for expressing conceptual models. It sits uncomfortably between the mass media world of commercial and mechanical reproduction and the esoteric fields of fine art. After centuries of tradition as the medium for disseminating published information, the technological advances in high volume print production and commercial publishing has left it as an essential creative vehicle in much the same way as the advent of photography caused the medium of painting to re-evaluate its meaning and purpose. One could draw a similar parallel with The practise of Photography, a medium that evolved from the spheres of both science and art, whereby the invention of digital photography has caused a re-evaluation of the essential qualities of the film-based techniques and handmade print. Nearly all commercial photography, whose target is reproduction as printed or screen image, is now made digitally for ease of transmission, translation, speed and economy. This alternative route from camera to output has highlighted the beautiful and unique qualities of the handmade photographic print, further confirming its position as an artistic medium. For six centuries the techniques of engraving, etching, woodcut and lithography were the methods of commercial illustration. The development of mechanised automatic printing presses at the end of the nineteenth century left the handmade printing techniques with the artists and highlighted how beautiful, complex, fascinating and precious those techniques are. Artists continued using the traditional methods for creating images, a practise that would become known as ‘printmaking’, to differentiate it from commercial printing. As technology constantly moves on and machinery becomes outdated, printmakers are able to get hold of obsolete machinery and expand the possibilities for image making, particularly the ability to incorporate photographic imagery. The accelerated pace of change in the printing industry over the last two decades and the digital revolution, has opened up enormous possibilities for printmaking. 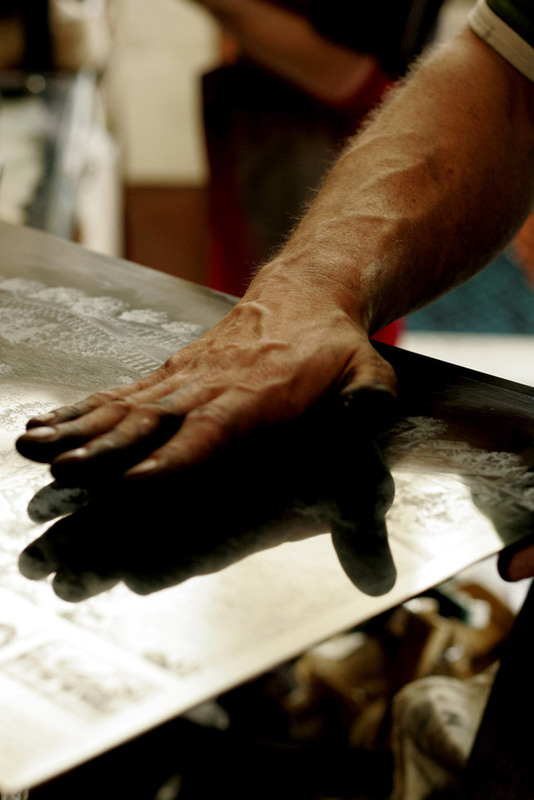 Although the final product of printmaking practice is usually a two dimensional image, the making of intaglio or relief prints is almost a sculptural process and the techniques of etching and engraving did originally evolve from the silversmiths’ guilds and the armourers’ workshops.